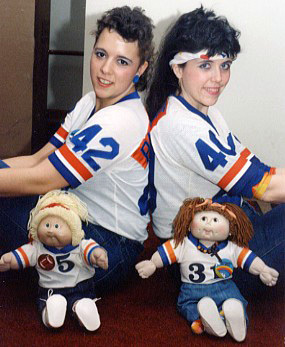 "Teamie Joy" in 1987 with Rachel (#42) and Sherry (#40), in 1988, and in 2006 (right). 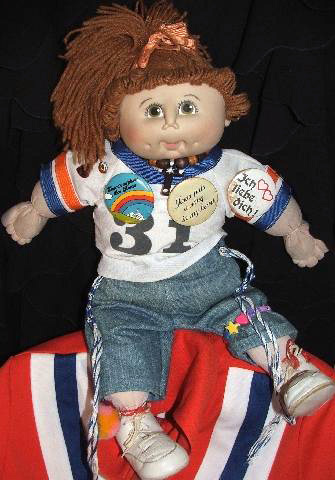 I still have that "Teamie Joy" Doll! She is in a place of honor on my bedroom shelf with other Team memories. I used to take her everywhere. She took a lot of beatings from the guys. Some of the guys would hold her ransom so that I would do favors for them. She was used as a football on many occasions, a head ornament, you name it. Annie made the outfit for her, the pins and cross necklace were given to me by kids that I wrote to, and the Ich Leibe Dich pin was from my Mom. It means "I love you" in German. 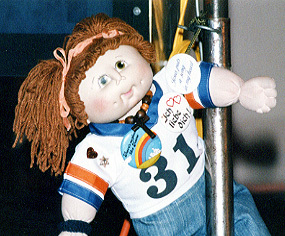 Sherry (aka Shirah) ministered with The Team in 178 shows over seven years between 1984 and 1991. She lives with her husband and son in Israel. 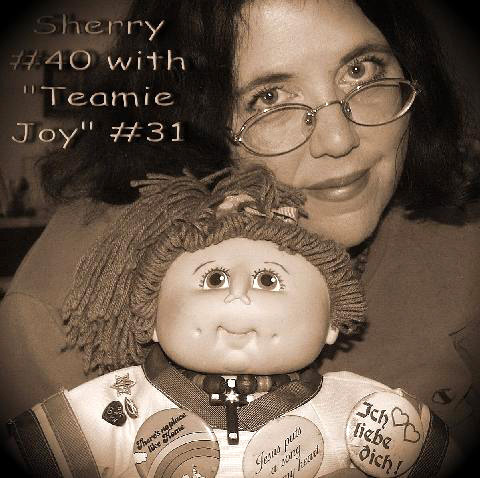 Click here for a special treat - a gallery of "Teamie Joy" #31 (and a few "Teamie Robin" #5) photos, then and now. Sherry took the photos which start with "S" file names in October 2006. 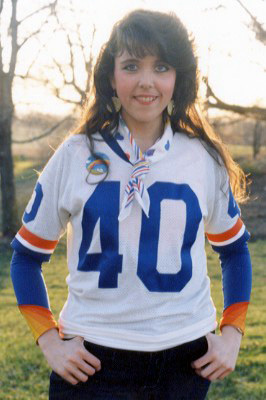 Also included is a photo of the dress she wore as "The Backslider" and some of her other Team memories. The other photos are c.1985-89, and include some photos of Sherry from her Team days, and there are a few from the 2006 reunion. Nice to know that even halfway around the world, if you're invited into a certain home, you can visit with a very special sister we had the opportunity to share some ministry with for seven wonderful years.